Fill cake pans with small toys and water. Freeze solid then empty onto the grass! 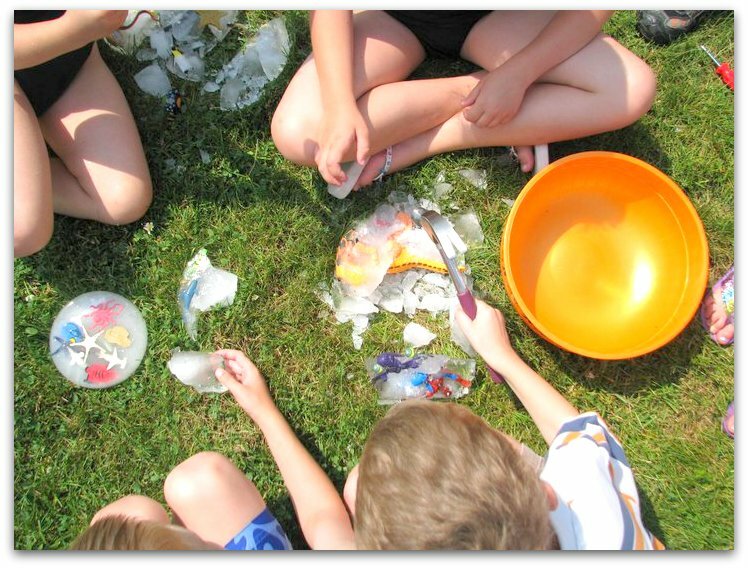 Kids love excavating the small treasures with tools while the ice melts in the sun! A great summer outdoor kids activity! Ice excavating is one of our FAVORITE outdoor activities! There are so many different ways you could take this as far as themes go. Fill a container (metal cake pans work GREAT) with small toys and/or objects. Fill with water and freeze. A 3″ cake pan takes just a couple of hours to freeze completely. Once solid, turn upside down and run warm water on the back of the container until the block of ice comes loose. Use small tools (mini screw drivers, small hammer) to crack the ice open. Once the kids get a nice crack going, the rest breaks apart really easily and they have no problem retrieving or “saving” the toys. We’ve done this kids activity countless times and it’s always fun to surprise the kids with this in the summer when friends come over. Easy, inexpensive, hands-on… go ahead and try it! Summer is almost here and the summer toys have hit the shelves. What can you do with a pool noodle? Probably more than you think! Here are 12+ Summer Pool Noodle Crafts and Hacks! From toys to games, and gardening to crafts! The possibilities are endless. For even more summer fun activities be sure to check out our Easy Art Projects for Kids Pinterest Board! I do ICE therapy with Wyatt, doesn’t that sound torturous?!!!! I put his hands in a bowl of ice for sensory integration. He actually doesn’t mind it! But he does like to throw the cubes down to the ground, then laughs when they shatter. What a rascal. Glad you had such a beautiful trip. Welcome home! What am great idea! My kids would love to do this, especially since it’s so hot outside! What a great idea, my son would love this!! Your pictures from Alaska are beautiful, we LOVE it up there and hope to get back in the next couple of years. I’ve seen this idea on lots of blogs and I can’t wait until my daughter is a little older to try it out! This is truly a creative idea!! How fun! I never would have thought! AWW!! I’m happy to be your newest follower of your delightful blog! Be sure to come by FrouFrouDecor..I love having new friends! I also have a link party every Friday and would love to have you link up! This is soooo fun!!! I can just see my little Happy Buddy LOVING this! Right now he is obsessed with ice – so this is perfect! Thanks for the summer idea! that is such a fun activity! great idea!